A little over a year ago, I dragged my then 2-year-old daughter on a food adventure while in Los Angeles visiting my family. “We are going to have noodle soup,” I told her. She just nodded and asked if we could get ice cream after. I wasn’t sure how she would respond to ramen, but I was determined to check out a spot called Ramen Jinya in Studio City at the recommendation of another “foodie” friend, and figured kids like chicken soup, so how bad could it be? I never imagined that such a simple food adventure would turn into a new family obsession. 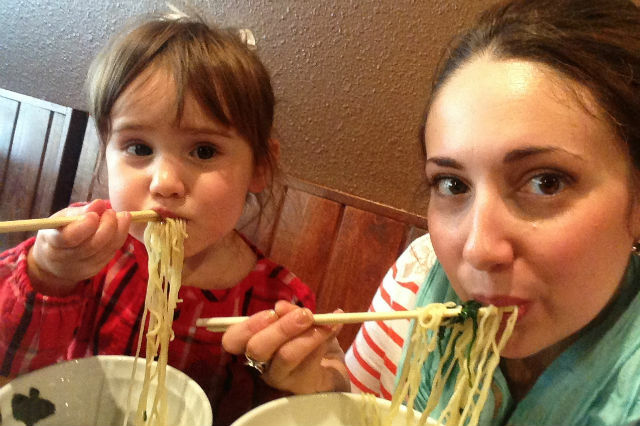 My 2-year-old became enchanted by “slurpy noodles” and I became enchanted watching her devour an entire bowl of ramen, using chopsticks and all. Ramen shops are opening up all over the place, even here in the ‘burbs of New Jersey. And if you are thinking this is the ramen soup that costs 99 cents in the supermarket and comes with those little flavor packets full of salt and chemicals, think again. 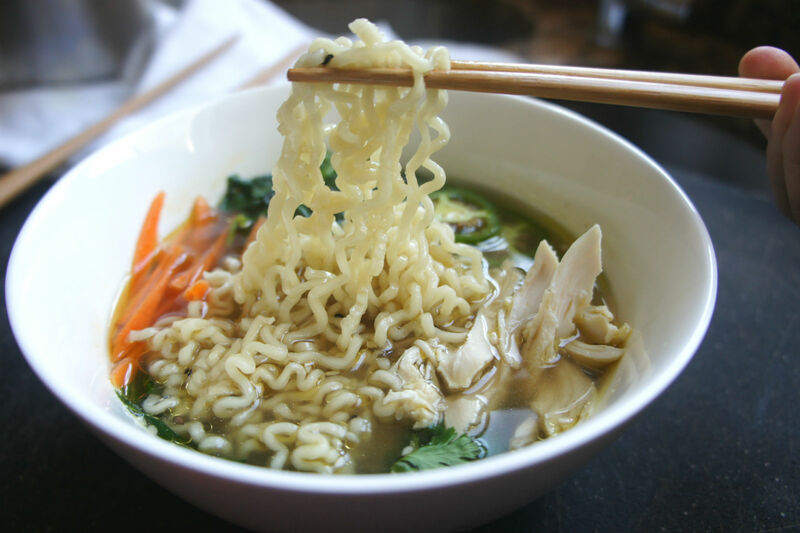 Ramen restaurants have been some of the most acclaimed and trendiest eateries in the U.S. over the past few years, made with incredibly rich broths and a variety of fresh ingredients. But are they kosher? Ha, definitely not. Or at least not yet. Since that first ramen jaunt over a year ago, we have ventured to ramen joints near and far (often at her request), and finally I decided it was time to start experimenting at home to satisfy my sophisticated little eater. Making ramen at home is not much more complicated than making a rich chicken broth, in my case made richer with additional marrow bones and some Asian-inspired aromatics like cilantro, ginger, garlic and soy sauce. 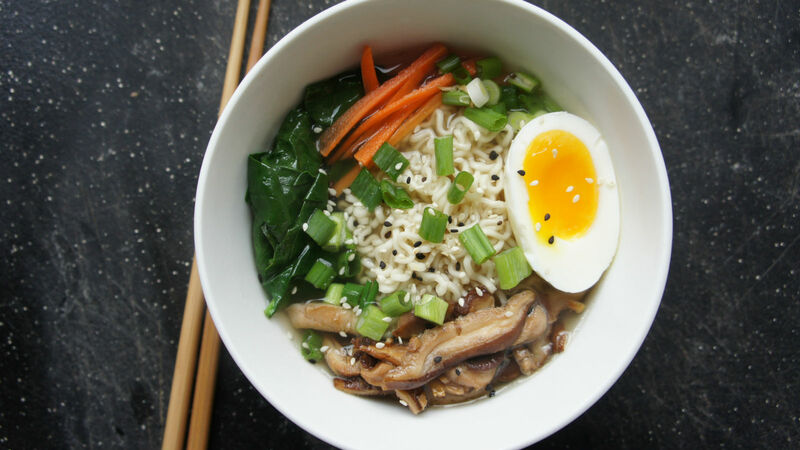 Aside from slurping down those squiggly noodles, one of the fun parts of ramen is the array of toppings you can lay on top. Mix and match until you find your favorite flavor combination, or consider having a ramen party and letting guests top their soup with all the choices. Where to buy noodles? I bought a plain package of noodles at Whole Foods, but you can also buy those 99 cent packages and just discard the flavor packets. Place whole chicken, marrow bones, veggies and herbs in a large pot and cover with around 6 quarts of cold water. Bring to a boil and then reduce heat to low medium, simmering. Simmer soup for 1 1/2 hours, skimming fat and brown stuff from the top continuously. After 1 1/2 hours, remove the chicken and set aside. Continue to simmer another 1-2 hours. After chicken has cooled slightly, remove skin, and cut or shred chicken into pieces for serving later. Place in a plastic container. Once soup has simmered around 3 hours, remove marrow bones and veggies and pour through a fine mesh sieve. Once soup has cooled, you can freeze at this point, place in the fridge overnight (soup is usually a little tastier the next day) or use right away. Place broth in a large pot and warm up over medium heat. Heat 1 Tbsp olive oil in a pan and saute garlic and ginger until soft and fragrant, around 2-3 minutes. Add soy sauce and reduce slightly. Add to warm broth. Cook noodles in boiling water as directed, around 3 minutes. Serve soup with shredded chicken, soft boiled egg, fresh cilantro, veggies and other toppings of your choice (see suggestions above). This gently seasoned beef and barley mushroom soup is a cold weather classic. Forget slaving over a hot stove and set your slow cooker for one of these delicious recipes.